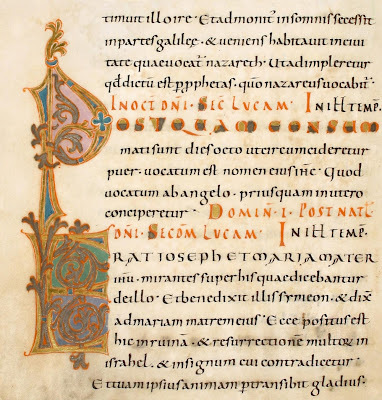 This exquisitely beautiful manuscript, based at least in part on the Lorsch Gospels, was created in about 969 AD for Archbishop Gero of Cologne. 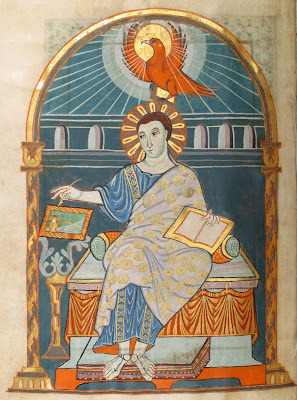 I suppose there may have been restorative work carried out in modern times but the quality of preservation, after the passage of more than a thousand years, seems remarkable. 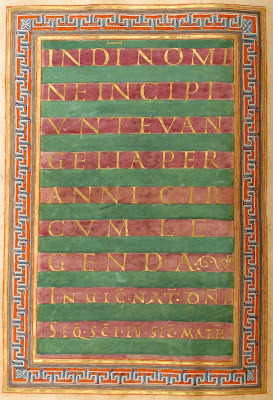 Written in carolingian miniscule, the Gero Codex is the earliest of the Gospel manuscripts produced in the Swabian Abbey of Reichenau. 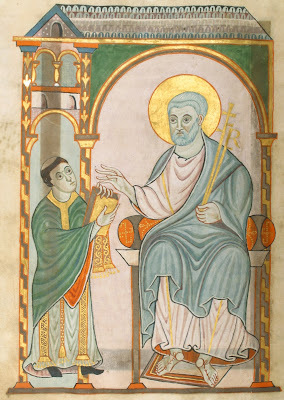 All of the full page miniatures are featured above and as far as I can make out from some rough translations, they include Saint Peter and the 4 Evangelists, Archbishop Gero and the presentation of the completed manuscript to him. 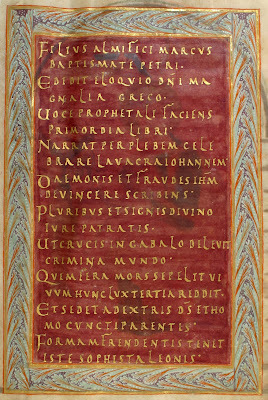 The Gero Codex [HS. 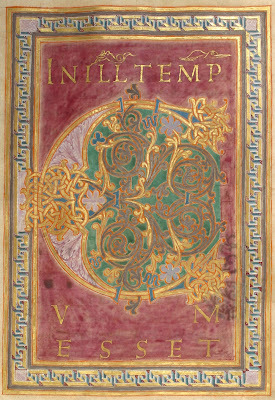 1948: Gero-Codex, Evangelistar UuLB Darmstadt] is housed today in the State Library in Darmstadt and the web presentation of the ~360 page manuscript is hosted by Manuscripta Mediaevalia (don't worry if the first page doesn't load, just arrow across - the miniatures are at the front of the work). "The Register [pdf] of world documentary heritage currently comprises 91 documents from 45 countries. 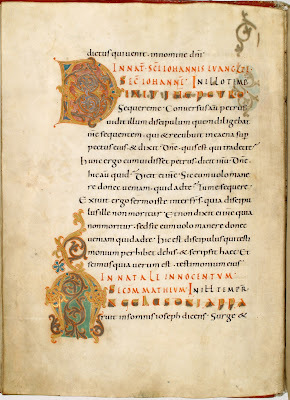 Included since the end of 2003 are the ten illuminated manuscripts from the monastery on the island of Reichenau in Lake Constance, which itself had been added to the list of UNESCO World Heritage already in 2000. 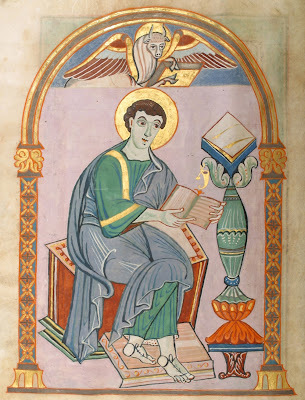 The manuscripts are outstanding specimens of Ottonian book illustration in Germany. 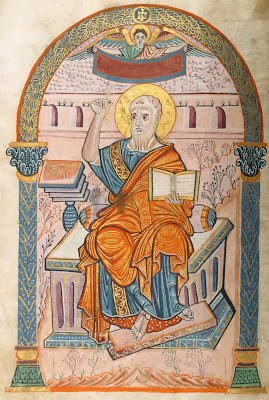 They have been selected as examples of the development of the monastic scriptorium, and of artistic innovation in book decoration. 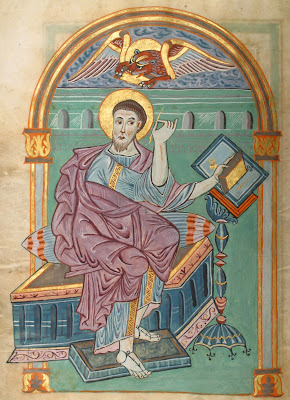 They are distinctive for the iconographic themes in their miniatures, and for the way in which they relate to the religious, political and cultural history of their time. 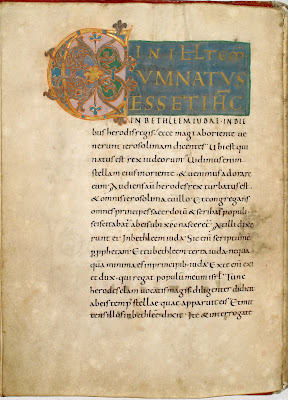 The manuscripts are thus representative of the entire group of surviving manuscripts with Ottonian illumination from the Reichenau. 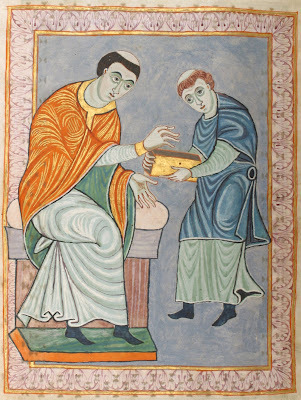 In the 10th and 11th centuries, the Benedictine Abbey of Reichenau housed an artists' workshop, which was probably the largest and most influential in Europe. 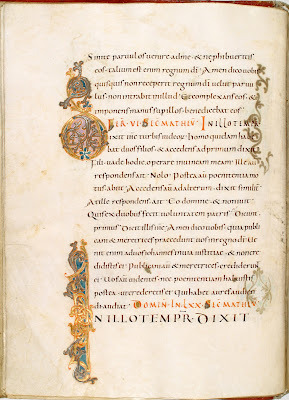 During its main period of activity, between c. 970 and 1010-20, a series of mainly liturgical manuscripts with precious decoration was produced there, commissioned by the most prominent members of contemporary society - Bishops of the Empire, Kings and Emperors. 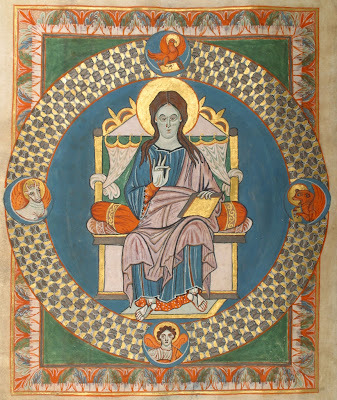 With vivid artistic imagination and remarkable innovation, the monks created great works of art whose beauty and perfection continue to fascinate us. 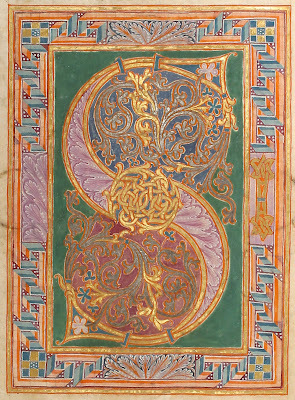 Their design was inspired by Carolingian book illumination from the workshop at the court of Charlemagne, as well as by early Christian and Byzantine models." 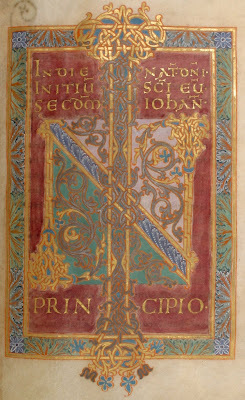 Reichenau School of illumination: i, ii. 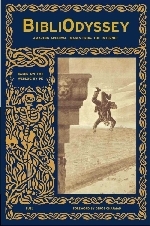 Medieval Germany - this University of Florida course outline gives a brief general historical overview with numerous useful links. Oh thanks for that madcynic - I was obviously asleep at the wheel. I blame everybody but myself. Wow, what a stunning blog you have. Duly linked & blogrolled. 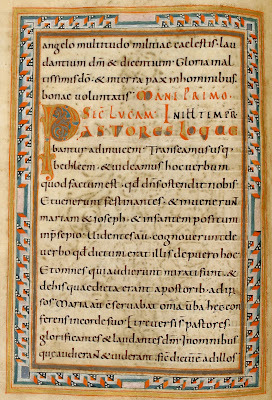 These manuscript pages remind me that "multimedia" existed long before digital technologies. Thanks for the kind words Meredith. I once loved a woman in Marrickville. If only she had been there at the same time.. 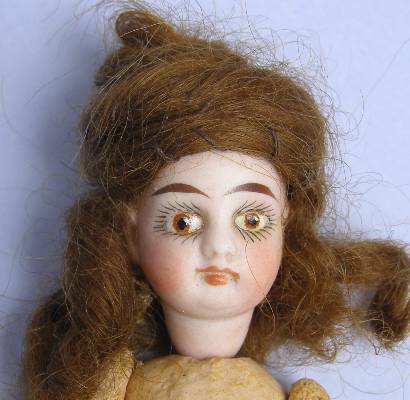 Thank you, once more Peacay, for your wonderful blogs. After several months of work, I have finally finished my Saxon Gospel Serving Tray. Not quite deviant art Kittybriton, and I would think twice about plonking glasses and plates on top of it! Good one! !